Take your love of all thing exotic to the streets in this exciting costume. 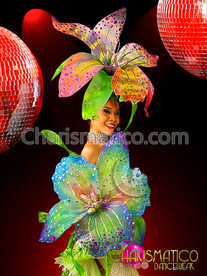 Consists of flower embellished Dress and matching headdress. Be the goddess of desire and fertility or simply celebrate the return of spring in a way that only you can. Each of the Flower has been Glued onto the dress.